Emilio Rojas (b.1985, Mexico City) is a multidisciplinary artist, working primarily with the body in performance, using film, video, photography, installation, public interventions and sculpture. Rojas utilizes his body in a political and critical way, as an instrument to unearth removed traumas, embodied forms of decolonization, migration and poetics of space. His researched-based practice is heavily influenced by queer archives, border politics, botanical colonialism, and defaced monuments. His works have been exhibited in the US, Mexico, Canada, Japan, Austria, England, Greece, France, Germany, Italy, Spain, and Australia. 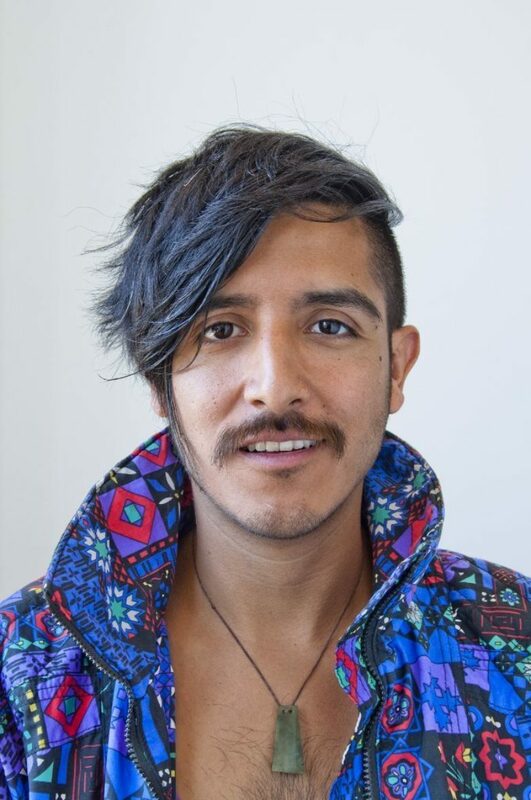 Besides his artistic practice, Rojas is also a translator, community activist, yoga teacher, and anti-oppression facilitator with queer, migrant, and refugee youth. Rojas recently graduated from SAIC with an MFA from the Performance department. Galeria Jose de la Fuente in Santander, Spain and Gallleriapiú in Bologna, Italy represents Rojas’ work. Learn more about Emilio Rojas’s solo BOLT exhibition The Master's Tools Will Never Dismantle the Master's Monuments. Informed by the politics of the U.S./Mexico border, the events that happen on it, and the transnational narratives that arise after crossing it, I tackle issues of race, identity, gender, and Latin stereotypes using visual tropes of celebration. Candy Land signifies an America filled with the possibility of happiness in contrast to Mexico. My ongoing project Borderland Series employs confection, industrial materials, and the American board game "Candy Land" as a conceptual framework to juxtapose the borderlands of the U.S. and Mexico. The spaces in the “Candy Lands” of my work relate to immigrant utopian visions of the American Dream. The monuments and towers, built from accumulated candy, frosting, and found objects exemplify the excess associated with the American Dream. They stand as living shrines to real life individuals, such as individuals who died at the border, family members who have crossed the border, in conjunction with Mexican American icons like Selena Quintanilla to further complicate the transnational narratives of Mexican Americans in relation to the border. The installations include a video piece, Really Safe in my Room in America, 2016, that layers personal photographs with found images of the border. It complicates my acquired safety of living in America in relation to the violence on the border. 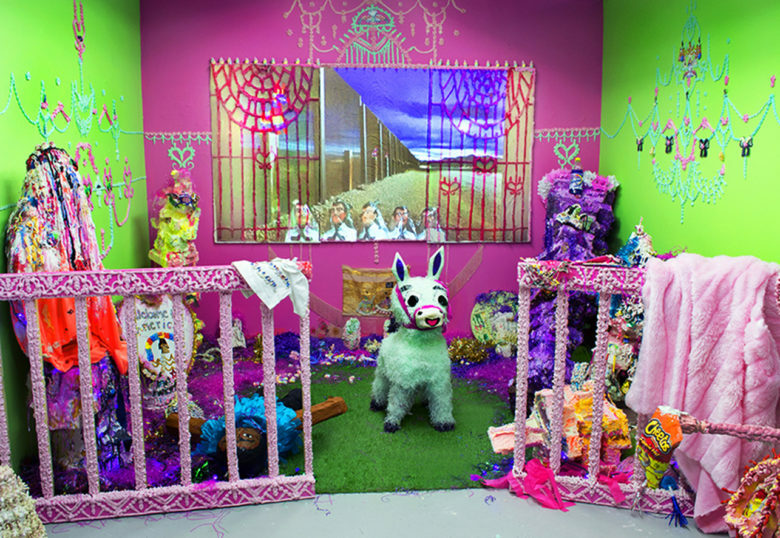 The smell, candy, decoration, and personal photographs in my installations and videos serve as an ironic strategy that critique the glut of violence at the border. 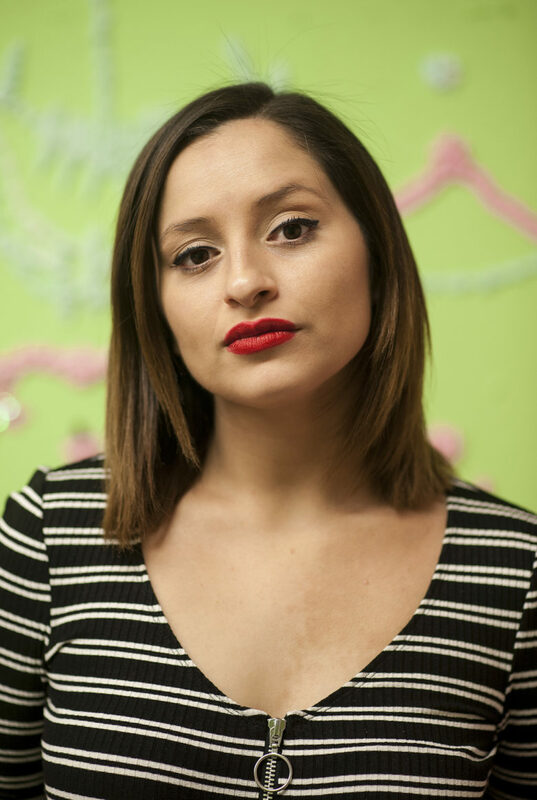 Learn more about Yvette Mayorga's solo BOLT exhibition, The Politics of Desire.